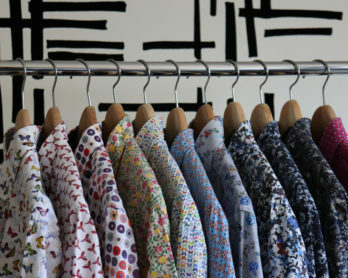 I really enjoy sewing and love making things, but I have very few clothes in my wardrobe that I made myself. The reason for this is a) finding the motivation is hard, and b) even when I’ve done something before, I don’t often recall exactly how to do it. This is why I really enjoy sewing workshops. Not only do I get the motivation to start my project – I’ve booked and paid for the class, so I have to go along – but I also get a reminder of all the steps, expert help along the way, and it’s a usually a nice sociable environment which leads to an all round great experience. 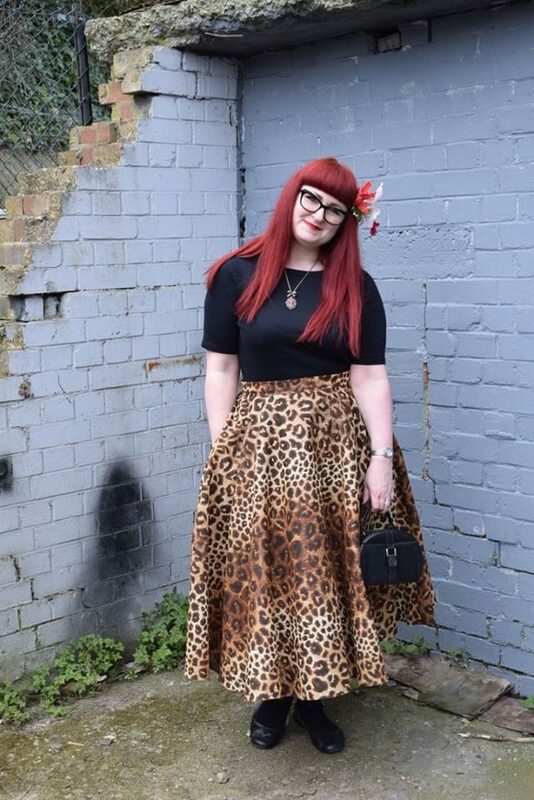 I’ve been looking for a good leopard print circle skirt for a while now but, for something that I would consider to be a pretty standard wardrobe item for anyone who’s into retro style, it’s actually become a really tough thing to find. 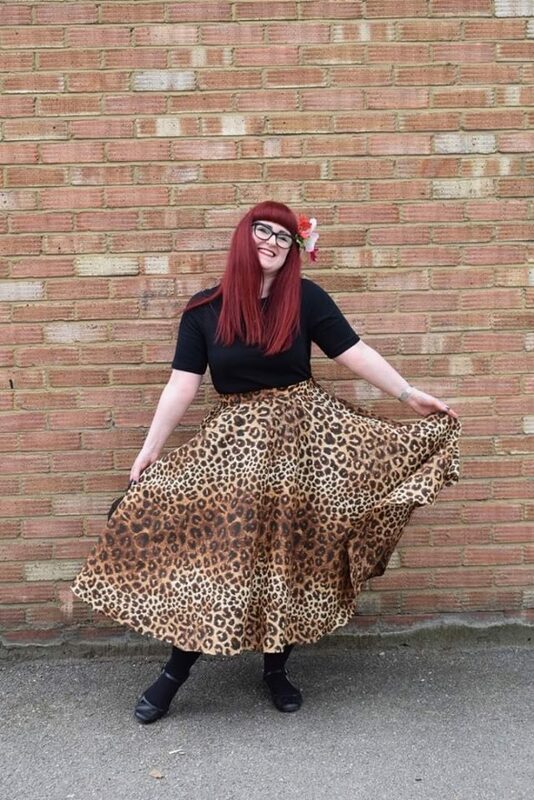 Vivien of Holloway had one, but it never seemed to come back in stock so I emailed them and was told that they are not going to be making the brown leopard circle skirt again. 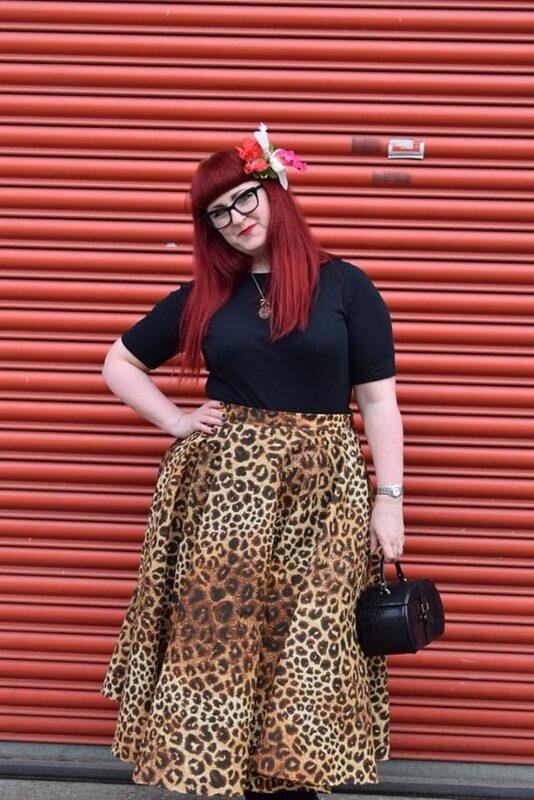 So, when I saw that the multi-talented Sophia Brown had started running her circle skirt workshops every weekend, I checked my diary and booked a date. The workshop costs £120, but seeing as the VoH skirt I’d been planning on buying was £80, this seemed like a bargain (providing my sewing skills were up to scratch!). When I asked if she could get some leopard print fabric for me, Sophia was more than happy to accommodate. The studio is really easy to find – only a short walk from North Wembley station – and I was soon settled in with tea and chats. My delightful mug (see above) was part of a super cute unicorn set which comes out for afternoon tea to celebrate the finishing of your skirt, so I’d recommend bringing a small lunch along, so that you have room for cake! If you don’t bring lunch, there’s a small Tesco nearby. Once I’d got myself settled, it was time to start planning my skirt. 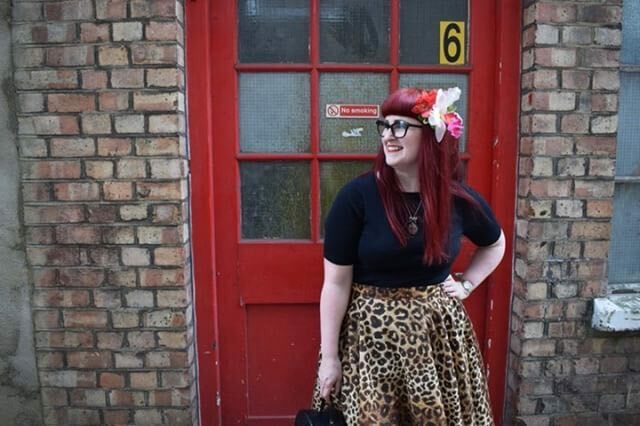 First of all, we took my waist measurement – making sure it was snug enough for a well-fitting waistband, but not so tight I couldn’t breathe – and then we measured from my waist down to where I’d like the bottom of the skirt to be. I wanted quite a long skirt so that it will cover most of my legs in summer, but you can have it whatever length you like. 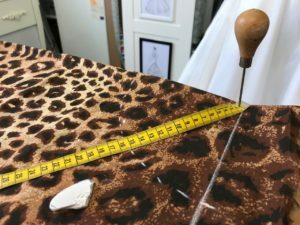 Sophia had found some gorgeous leopard print fabric and started to explain to me how we were going to plan to cut out the circle pattern. The key is, working on a quarter of your circle and cutting this on a folded piece of fabric, so that you end up with two semi-circles. 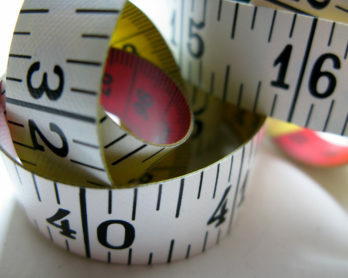 You need to be able to pivot your tape measure to be able to mark out your circle, so I’m not sure how I’m going to be able to do this at home as I won’t be sticking an awl into my dining room table! Once we had the quarter circle drawn out in tailors chalk on the first folded piece of fabric, it was time for cutting out. We then used that piece as a template to cut out the second piece. Pattern placement is pretty odd on a circle skirt, because some bits end up upside down on the finished skirt while other sections are the right way up, so it’s important to choose a fabric with a design that doesn’t all need to be the same way up. There were stripes of darker spots on my leopard fabric, but I could quickly see that these were going to look great going across my skirt. After cutting the two main pieces of the skirt, we needed a waistband (with a fusible interfacing ironed on to stiffen it), a placket (to cover the back of the zip), and a pocket… because every skirt needs pockets! As one of the side seams of my skirt would have the zip, there was only going to be one pocket, but making the pattern for that was way more simple than I thought. You place your hand on the fabric, spread out your fingers and draw around it! Make sure you make the top of the pocket wide enough to fit your hand in though – we had to widen mine a bit after it was stitched, but Sophia was on hand to help. 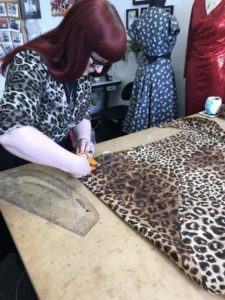 This was great for someone who had never made a garment without a shop bought paper pattern before, as she was on hand to explain every part of the process, remind about adding seam allowances, and help fix any problems. Next, it was onto the sewing. I topstitched the pocket pieces to the skirt pieces and then stitched that side seam together, remembering to go around the pocket so that I could still get my hand inside when it was done. The other side seam was a bit more tricky because there was a zip involved (for some reason these always terrify me!). Sophia carefully explained every part of this, and let me take some reference photos for when I try it again at home. You’ll need a zip foot for your sewing machine for this bit, but most come with this and they are easy to find if you need to buy one. Sophia also encouraged me to take notes throughout the workshop, so that I would remember how to do all this when I got home. It would have been so easy to just follow along on the day and go home with my skirt without recording how I did it, so I’m glad she reminded me. 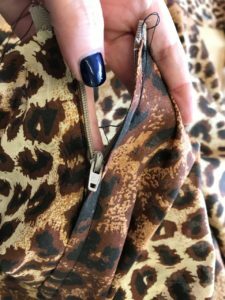 After inserting the placket, so that the zip isn’t touching your skin when you wear the skirt, the next step was to add the waistband, with super sharp corners to make it look professional. Obviously, we tried the skirt on to make sure it fitted and see if any tweaks were needed – this is a very important step. Now it was all about the finishing touches. Sophia had selected a button that she thought would work well for my skirt, and showed me how to create a button hole with the machine, with a great tip for cutting the hole after stitching – put a pin across the end of your buttonhole so that the seam ripper stops cutting at the right point. Once I’d added the button securely, the final step was hemming. As there is a lot of fabric at that end of a circle skirt, Sophia uses a narrow rolled hem foot for this, so that the edge of the fabric is automatically rolled over and tucked in as you stitch. It’s fiddly to do, but is quick once you get the knack. After the skirt was finished, we sat down for more tea and chats. I was way too full for cake (hence my recommendation above for having a small lunch! 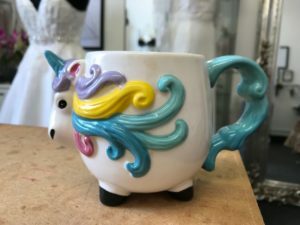 ), so we just had tea out of the unicorn mugs and recapped everything so that I could ensure I had everything in my notes. Then, we planned our mini photoshoot! I had worn a top that I thought would go well with my new skirt, but borrowed a small bag and some gorgeous hair flowers from Sophia’s stash in order to complete my look. 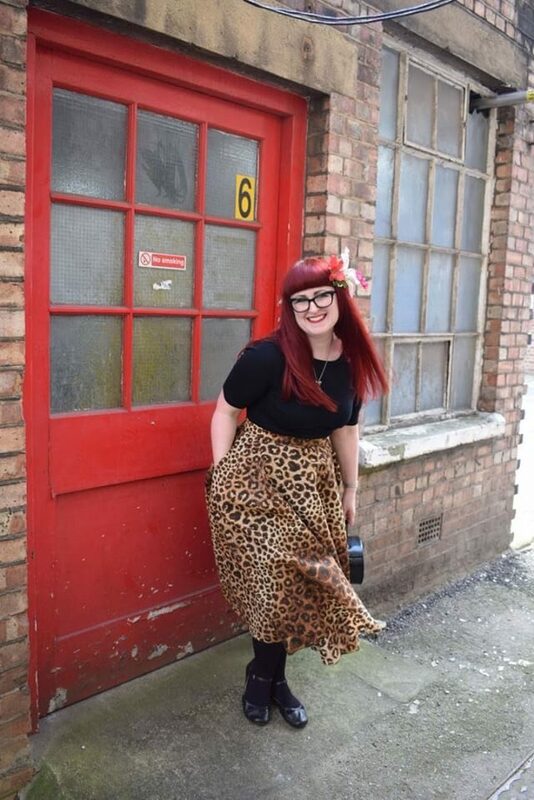 As it was a sunny day, we headed outside onto the industrial estate and found some fantastic spots for snapping pics of me in my brand new made-to-measure skirt. As you can see from the photos, it was lots of fun! The thing that really sets this workshop apart from others I have done is that it’s a full experience rather than just a short course. 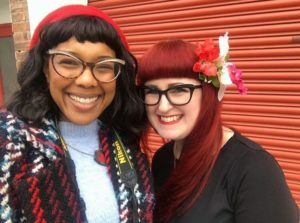 Not only do you get expert tuition from a friendly and welcoming sewing professional (Sophia makes stunning bridalwear) and a gorgeous skirt to take away, but you also get relaxed chats over afternoon tea and your own mini photoshoot as a record of a fun day. So much better than a certificate! 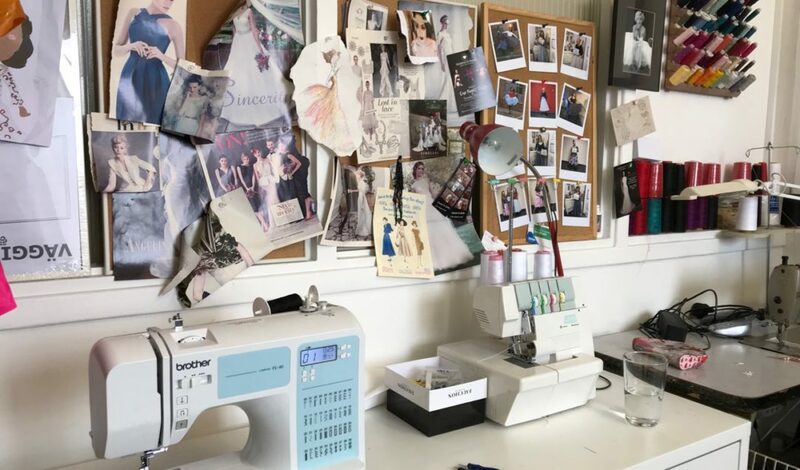 Sophia is now running her circle skirt workshops every weekend, at her workshop in Wembley. You can book onto your preferred date via Eventbrite. 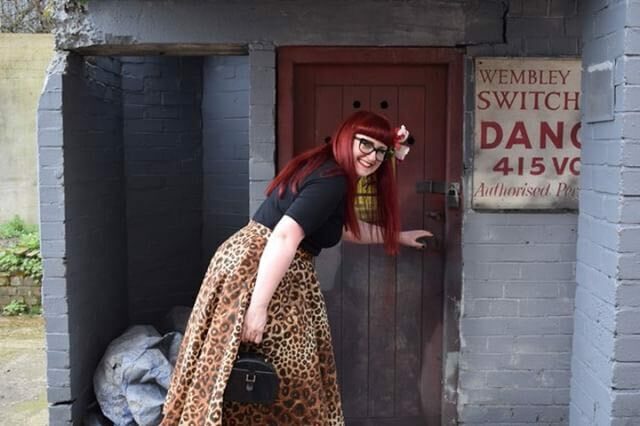 It’s perfect to book with a friend for a birthday celebration, or simply as a wonderfully fun way to treat yourself and create that skirt you always wanted.